This July 4th, wear Red, White and Blue - Not Black and Blue. July Fourth celebrates the signing of The Declaration of Independence in the United States. This document signifies our nation’s independence; a time when the original colonies fought for our freedom and independence. Although the signing took place in 1776, well over two hundred years ago, the sentiment of freedom and independence is still as strong as the toll of the Liberty bell, crack and all. That’s why freedom and independence remains a vital ingredient to a happy life regardless of age. However, when one gets older a medical emergency can result in independence being compromised, even eliminated, for the sake of safety, especially when a medical emergency can sneak up on you as quietly as Washington crossing the Delaware. When it does, lasting damage or disability can be minimized, and even death may be prevented the sooner help arrives, preventing black and blues from being permanent. Cloak yourself in the red, white and blue colors of freedom by getting Life Alert. 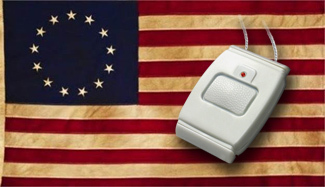 Life Alert Protection assists with the American dream of freedom and independence with the pursuit of happiness while remaining safe and protected. Life Alert’s medical alert system has a patented 2-way communication monitor and a lightweight, waterproof emergency button that can be worn on the wrist or as a pendant. When home emergencies arise, such as medical, falls, fire and even home intrusion, just press the emergency button. Just like setting off fireworks, Life Alert will rocket into action getting you the kind of help you need fast, 24/7. Or if you have a venerable elder who spouts a “Give me liberty or give me death” speech every time you mention retirement home, then Life Alert is the peace treaty that could prevent a Revolutionary War taking place in your family. Life Alert members enjoy the freedom of living in their own homes longer, up to 6 years or more, without having to go into a retirement community. As the industry leader in personal safety, Life Alert provides as many areas of coverage as there are military branches, and with cutting-edge technology that would make Ben Franklin proud. Life Alert offers protection for the home with monitored smoke protection and monitored CO Gas protection. They also offer protection on the go with a HELP mobile phone or a downloadable app. With these areas of protection -- your elders, their home, and their lifestyle can be as secure and mobile as a Yankee Doodle is dandy. Make safety your constitution and sign your own declaration of independence by signing up with Life Alert. Join the nation of Free and Independent seniors who are safe and can live alone without ever being alone. To learn more about how the many services of Life Alert simply call 1-800-380-0768 for a Free Brochure.